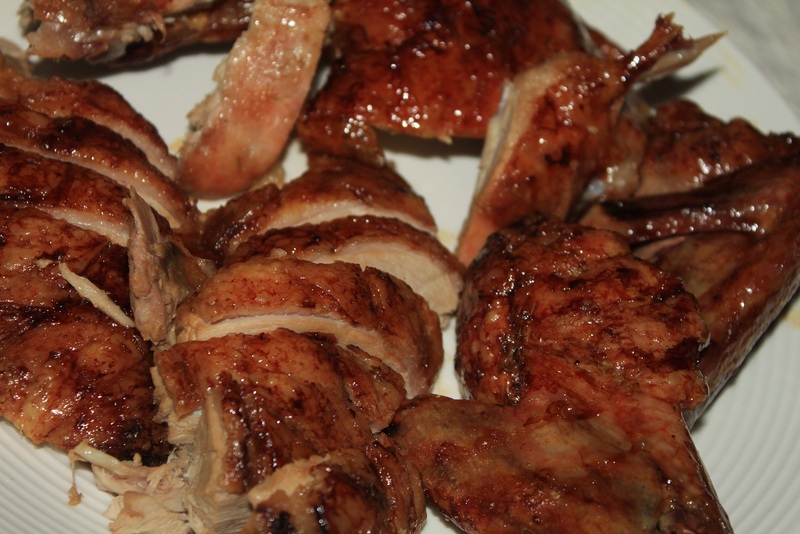 Duck is definitely a protein that I do not cook with often – coming to think of it, I don’t think I have made anything to do with duck – ever! But last week C and I decided that we were going to attempt to make a roast duck in lieu of the traditional roast turkey for Thanks Giving. As always before I embark on something new, I did a fair bit of research on various recipes and cooking techniques and found this fantastic blog The Hungry Mouse which had a step by step guide on ‘how to roast a duck’. It was brilliant and the photos incredibly helpful – especially when you are feeling uncertain and insecure about your cooking abilities (believe me…we all have those days!). The trick of this recipe, seems to be the low cooking temperature the long cooking time and the constant rotation and poking of the duck every hour for 4 hours! 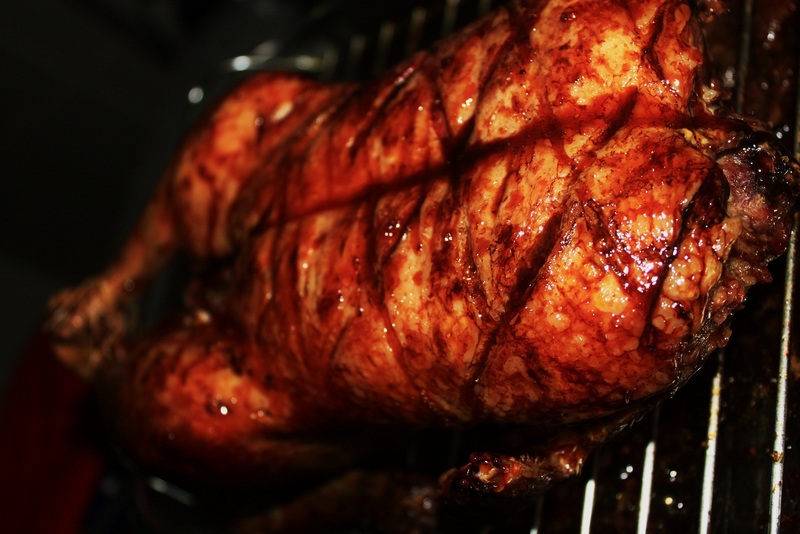 It is this poking, which ensures that you get very crispy skin, as it renders out all of the fat from the duck. Before you get scared off by the sound of this or by the length of the instructions below, let me reassure you it is actually rather straight forward and it is one of those dishes that pretty much looks after itself once it’s in the oven – just don’t forget to set your timer! Cut off any excess skin at either end of the duck’s cavity. There will be a lot of extra skin where the neck used to be, make sure you cut that all off. Cross the legs and tie them together with twine, and fold the wings behind the ducks body (as you would do with a chicken). Now season the duck generously with salt and pop it into the oven breast side up for 1 hour. 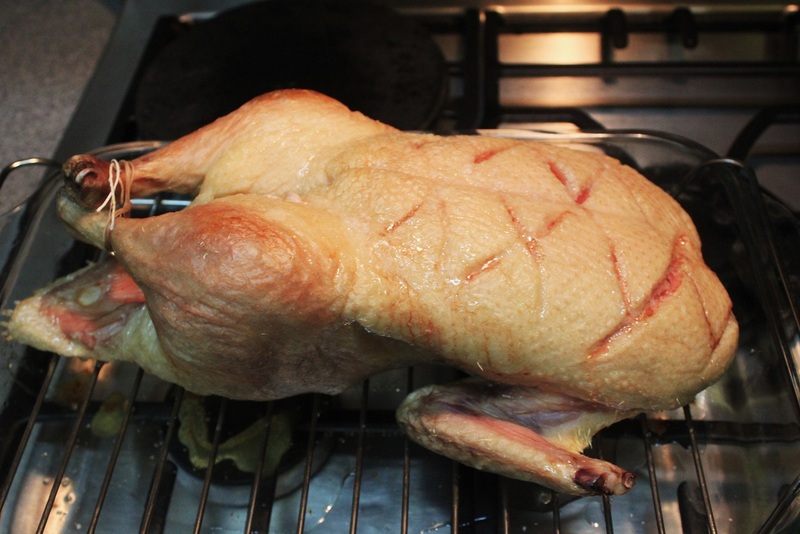 After the first hour, take out the duck and pierce the skin with a sharp knife all over the breast-side, paying particular attention to around the legs where there is a lot of fat.Flip the duck, so that it is breast-side down and roast for another hour. After the 2 hour, take the duck out of the oven, prick it all over and then flip it over again so that it is breast-side up. Pop it back in the oven for another hour. 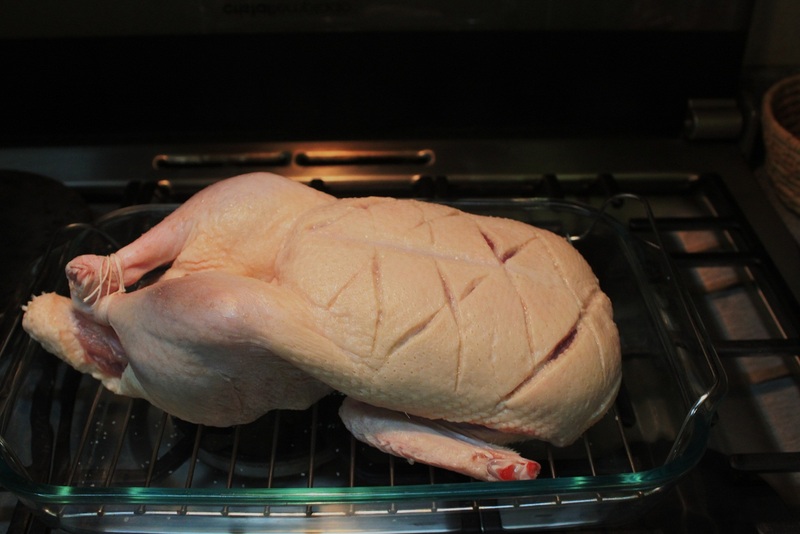 After 3 hour, repeat the step above, but flip the duck so its back to breast- side down. In the last hour, it is now time to make your glaze. In a medium sauce pan, combine the honey, molasses, orange juice, soy sauce and hot sauce. Bring to a simmer. Stir continuously over medium-high heat for a few minutes until it gets thick and syrupy. Set glaze aside until the duck comes out of the oven. After 4 hours of roasting and just before the glaze came on. 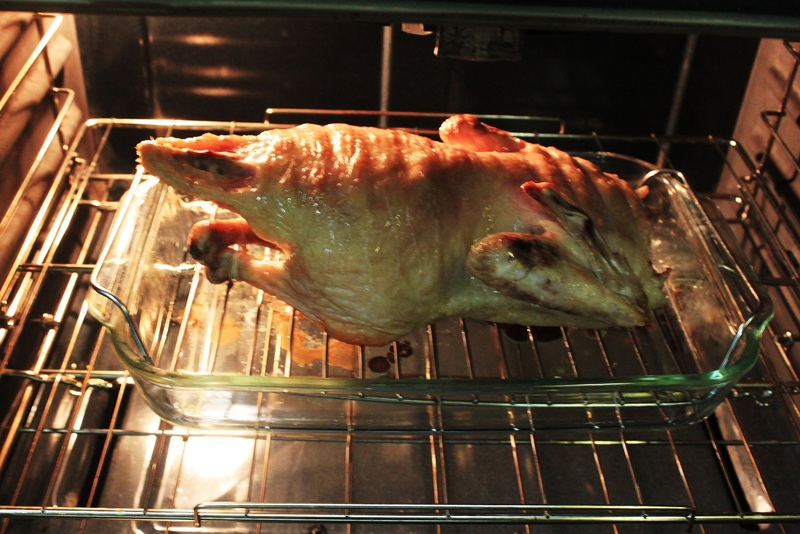 FINALLY after 4 hours take your duck out of the oven, and now increase the heat to 200°C. If you want to save all that rendered duck fat, do so now before you put the glaze on. Once the oven hits 200°C, flip your duck one last time so it is breast side up and pop it back into the oven for 10 minutes. After 10 minutes you should now have a pretty crispy golden brown duck on your hands. 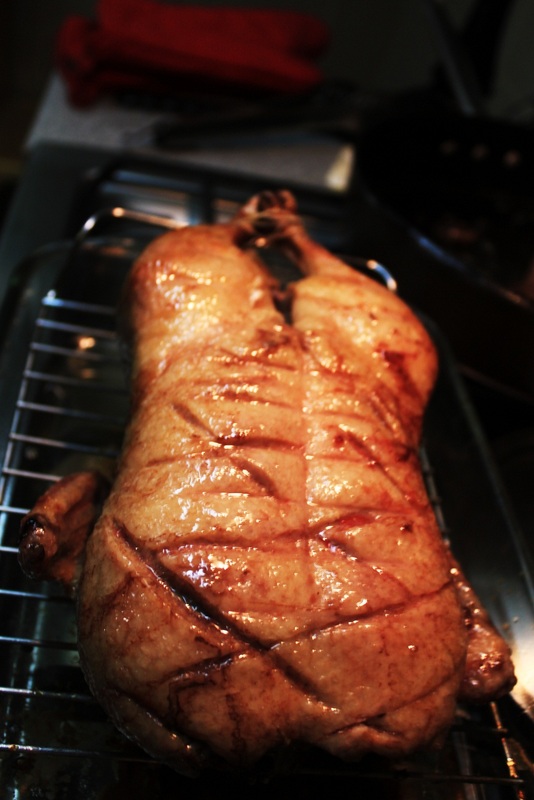 Take the duck out of the oven, and brush the entire surface with the glaze so that it is completely covered. Pop it back into the oven for a further 5-7 minutes, but keeping a close eye on it, and take it out immediately if it starts to burn. 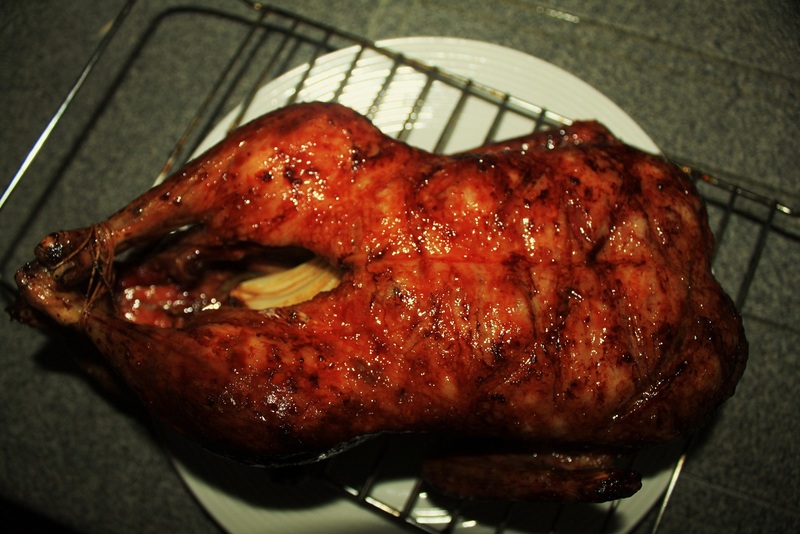 You should now have a beautiful mahogany roast duck!